We here at Kläger work on behalf of our customers as development partners and system suppliers for precision injection molded components made of technical ceramics and plastics. We are one of the leading manufacturers of complex injection moldings made of technical ceramics. Our divisions – Engineering, Mold Building and Injection Molding – cover the entire value-added chain involved in the creation of a product. The support we offer our customers is therefore founded upon the principle of end-to-end responsibility as product ideas are transformed into sales-ready products. Building upon our core skill of ‘injection molding’ and with our many years of experience in mold building, we offer a high level of materials expertise coupled with an equivalent level of implementation skills, especially in the application of successful ceramic solutions as substitutes for conventional materials and manufacturing processes. As a systems supplier of modular units combining ceramics and plastics, our aim is to satisfy the highest standards right down the entire value-added chain. Nothing less than this will deliver our customers and their products a convincing competitive edge. Many of the products we manufacture are key components for our customers. That makes us part of the process and, in many cases, we are involved at the very start of production. We are fully cognizant of the responsibility this imposes upon us. 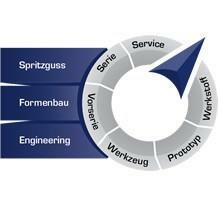 To this end, we work to deliver … 100% ‘good’ parts, at the right time, in the right quantity, at the right location.